The standard for wound closure and wound support. 3M Steri-Strip Reinforced Adhesive Skin Closures are the standard in adhesive skin closures, trusted for their convenience, simplicity and non-invasive design. A sterile, breathable adhesive strip reinforced with polymer filaments, for strong, reliable closure of incisions and skin lacerations. 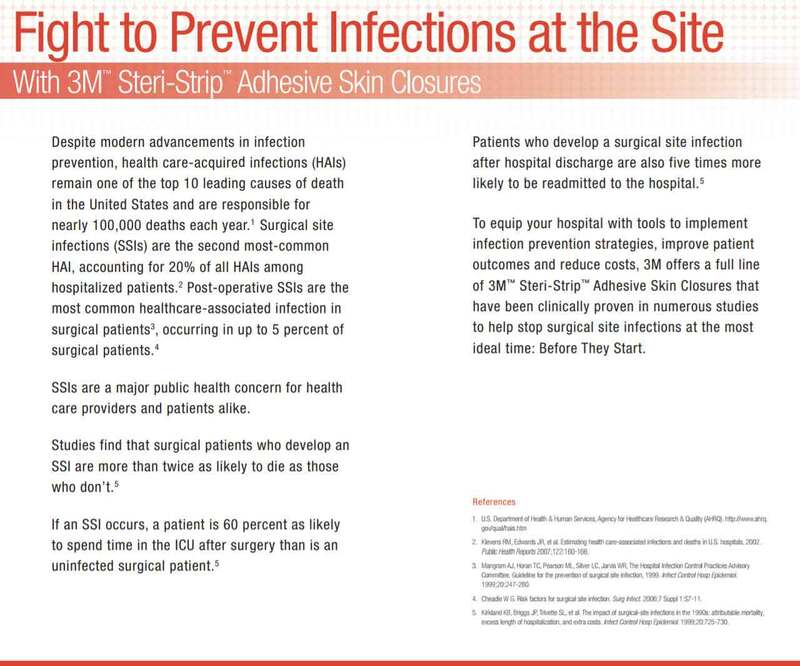 3M offers a full line of 3M Steri-Strip Adhesive Skin Closures that have been clinically proven in numerous studies to help stop surgical site infections at the most ideal time: Before They Start. For more than a century, people worldwide have looked to 3M for new products and ideas that solve everyday problems and make their lives easier and better. For decades, hospitals, clinics, and laboratories have trusted 3M as a dedicated partner supplying essential products designed to meet the unique needs of health professionals, thereby contributing to the advancement of better health practices, outcomes and quality of care. 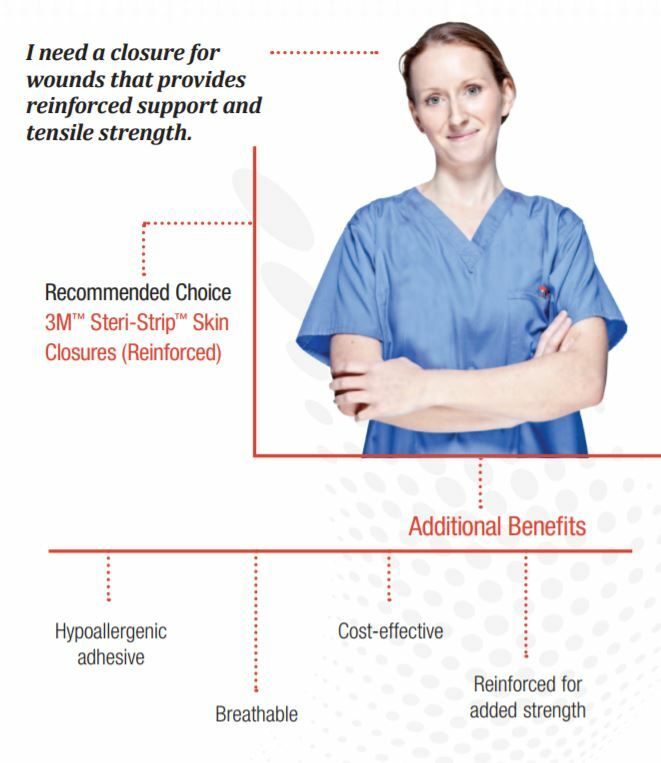 Which 3M Steri-Strip Skin Closure should I use for wounds that provides reinforced support and tensile strength? Conformable, flexible material stretches with body movement . Ideal for highly contoured areas or where edema is expected. Non-invasive, sterile design helps improve cosmetic outcomes, compared to sutures and staples, with less tissue trauma. (Reference on file). Soft, nonwoven backing and breathability enhance patient comfort. Adhesive is hypoallergenic. Known for their versatility, Steri-Strip Reinforced Skin Closures are used in the closure of lacerations, surgical incisions and following early suture/staple removal. For use in: emergency department, operating room, clinics and physician's offices, and same day surgery centers. Despite modern advancements in infection prevention, health care-acquired infections (HAIs) remain one of the top 10 leading causes of death in the United States and are responsible for nearly 100,000 deaths each year.1 Surgical site infections (SSIs) are the second most-common HAI, accounting for 20% of all HAIs among hospitalized patients. Post-operative SSIs are the most common healthcare-associated infection in surgical patients occurring in up to 5 percent of surgical patients. *The specific chemical identity and/or exact percentage (concentration) of this composition has been withheld as a trade secret. Question: Do reinforced Steri-Strip skin closures contain latex? Answer: No. Neither the packaging nor the Steri-Strip skin closures contain natural rubber latex. Question: Do reinforced Steri-Strip skin closures contain fiberglass? Answer: No. 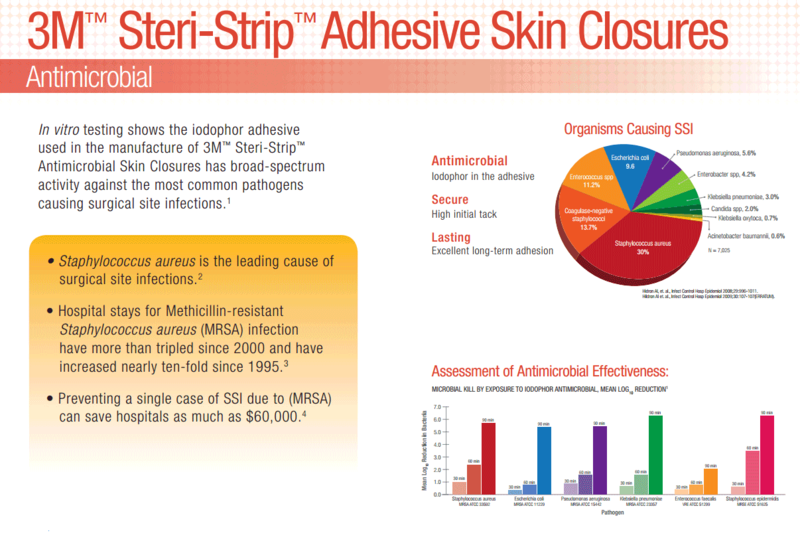 Steri-Strips skin closures have never contained fiberglass. 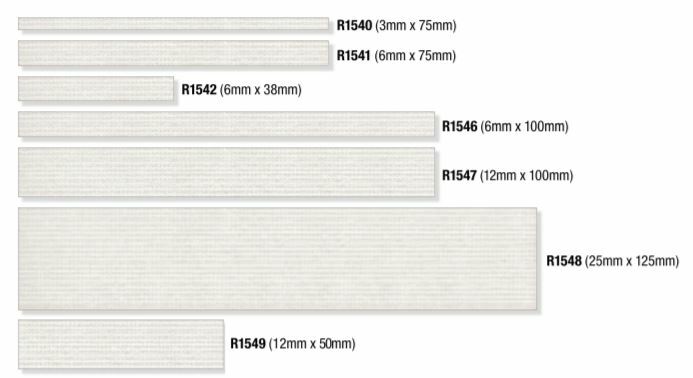 The reinforcing filaments in the reinforced Steri-Strip skin closures are made of polyester. Question: Are reinforced Steri-Strip skin closures hypoallergenic? Question: What is the shelf life of reinforced Steri-Strip skin closures? Answer: 5 years. The expiration date may be found on the top of each Steri-Strip skin closure package. Without breaking the seal, fold the rear package flap back. Holding the package up to the light, you will note: LOT, hourglass, year, 1-2 numbers, several letters The hourglass symbol represents the expiration date. 2004-10 would indicate that the product will expire in October of 2004. Question: Are reinforced Steri-Strip skin closures sterile? Can Steri-Strip skin closures be resterilized? Answer: Reinforced Steri-Strips skin closures are sold sterile. They may be resterilized with ethylene oxide if the product is removed from the envelope. Question: What is the best way to get great adhesion of Steri-Strip skin closures? Answer: Steri-Strip skin closures adhere best to clean, dry skin. This can be accomplished by ensuring that bleeding is under control and cleaning the skin with saline or alcohol to remove oils or exudates followed by gentle drying of the skin surface. Steri-Strip closures have a pressure sensitive acrylate adhesive. Adhesion of skin closures will be enhanced if you gently but firmly press or stroke the skin closure strip during application so that the adhesive gets into the nooks and crannies of the skin surface. See application instructions. 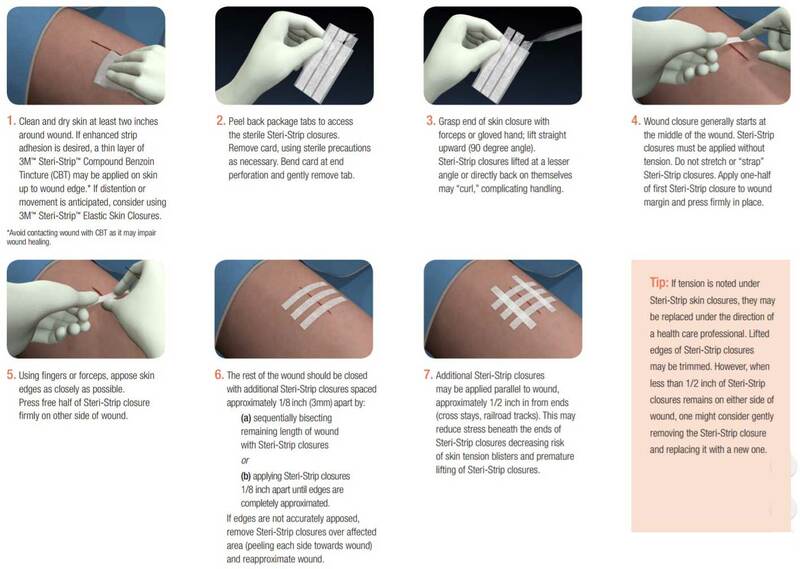 Steri-Strip skin closures are designed for closure of low-tension wounds. They are contraindicated for use in high-tension wounds that cannot easily be approximated with fingers or forceps or on infected wounds. Question: Should I use a skin tackifier under Steri-Strip skin closures? Answer: Compound benzoin tincture (CBT) may be used to increase adhesion of SteriStrip skin closures. Although, CBT does not contain iodine, it may be an irritant to some individuals and should not enter the wound. Question: What can I do to protect very fragile skin? Answer: Apply the skin closure to dry, clean skin that is free of chemicals. If hair is to be removed, a clipper should be used. To further protect from adhesive trauma, a skin barrier such as 3M Cavilon No Sting Barrier Film may be applied and allowed to dry thoroughly before applying the skin closure. Avoid chemicals designed to increase adhesion. To reduce the risk of skin stripping, gently remove Steri-Strip skin closures: "low and slow", towards the center of the wound, while supporting the skin. Question: What could cause blistering of the skin under the ends of skin closure strips? 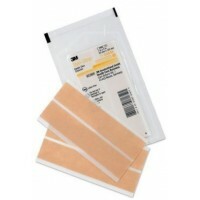 Do not use Steri-Strip skin closures on high-tension wounds. Apply Steri-Strip skin closures without tension. Do not strap the wound closed. Consider 3M Steri-Strip Elastic Skin Closures if edema, hematoma, distention, or movement are anticipated. Monitor the wound for evidence of swelling or blistering. If tension is noted under Steri-Strip closures, they may be replaced under the direction of a health care professional. Question: I suspect that the area around the wound may swell. Will this affect the type of skin closure I should use? Answer: Yes, if expansion or movement (such as over a joint) is anticipated, consider using Steri-Strip Elastic skin closures. Question: Are reinforced Steri-Strips skin closures safe to use on PICC lines? Question: How long can Steri-Strip skin closures be worn? Answer: Steri-Strip skin closures are usually worn until they fall off or the healthcare provider removes them. This usually occurs within 5 to 7 days for the standard reinforced Steri-Strip skin closures. Wear time may vary depending on area of the body, skin type, degree of friction to that area, etc. Some health care providers prefer to remove, and sometimes replace, the SteriStrip skin closures, on follow-up visits. The timing of strip removal and the length of continued reinforcement and support of the wound with skin closure strips is left to the discretion of the health care provider. Question: If skin closure ends loosen, should they be trimmed? Answer: Yes. Once the edges loosen, a skin closure strip is more likely come off than if the strip is intact. If the loosened ends of the strips are trimmed so that they do not catch on clothing, the duration of adherence is extended. However, when less than 1/2 inch of the strip remains on either side of the wound, health care providers may want to consider gently removing the strip and replacing it with a new strip. Question: Can I get Steri-Strip skin closures wet? Answer: Unless contraindicated, you may shower 24 hours after the Steri-Strip skin closures have been applied. Then pat the strips dry. However, some studies indicate that strip adherence may be improved when bathing is limited. For additional protection, you may cover the Steri-Strip skin closure with a 3M Tegaderm Transparent Dressing.